A must for all Pop Culture junkies. ‘Myriad weird and weirder showbiz stories with which to amaze, astound and possibly bore rigid close personal friends down the pub or in sheltered accomodation. A must for intellectuals and anoraks alike.’ Mark Radcliffe Did you know that those aren’t Julia Roberts’ legs on the ‘Pretty Woman’ poster? In fact the only things that are Julia’s are the head and the incandescent smile. Everything from the neck down belongs to Shelley Michelle, a model, actress and body double. Okay so maybe you knew that one, but how about these: Who – or rather what – won the very first Best Actor Oscar? What life changing discovery did Jack Nicholson make about his sister in 1974? And what in the devil’s name is the ‘Wilhelm Scream’ and how does it link ‘Planet of the Apes’, ‘Star Wars’, ‘Reservoir Dogs’ and fifty-seven other movies? Unlike most of what passes as ‘trivia’ – who really cares who’s had the most number ones? – these one hundred amazing, unfathomable, absurd and often implausible stories point towards some greater truth. 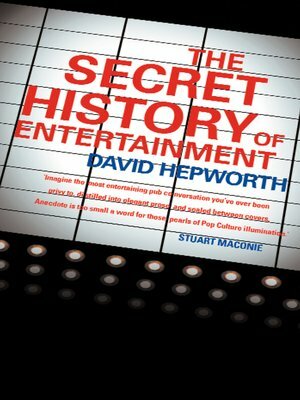 This is the secret history of entertainment. If ‘Schott’s Miscellany’ is the book of useless facts to be read in the smallest room in the house, then ‘The Secret History of Entertainment’ is the book of useful stories to devour and wow your friends with over a pint in the pub. David Hepworth has launched (and written for) some of the most successful magazines of the last two decades – including Q in 1985, Empire in 1988, Mojo in 1997 and Heat in 1999. He is the only person to have won both the Writer of The Year and also Editor of The Year awards from the Periodical Publishers Association. He has presented programmes for the BBC and VH1 and makes regular contributions on BBC Radio 4.